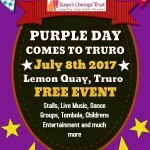 It’s that time of the year again, only this time we are bringing the purple brigade to Truro! We will have live music, dance groups, stalls and street entertainers. 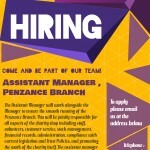 Come and join in our fun, don’t forget to wear purple! Some photo’s from our fantastic night with Johnny Cowling, thank you to everyone who attended, we raised a fantastic £1,175.00!!!! Thank you so much to everyone involved in the event. Who is coming next year??! !